Activity: As part of Naturally Healthy Month – Relax in Borough Gardens with a picnic, listen to live music and try out new activities. Activities are FREE (for adults and children) and will include* sessions such as zumba, yoga, outdoor gym sessions, singing, woodworking! Its all about using nature and outdoors to enjoy life, meet new people and learn new skills. Pop along for part of the day or spend all day soaking up the great atmosphere. This is a dementia friendly event. 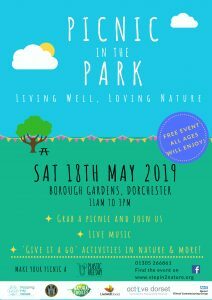 This event is free and is being delivered by Stepping into Nature, Natural Choices, Dorchester Town Council, Clinical Commissioning Group, LiveWell and Active Dorset. * Activity sessions will be confirmed closer the date.